If you have been the victim of a rear-end collision, you are not alone. Estimates put the number of such crashes at roughly 2.5 million annually in the United States. If you have suffered serious injuries, a local personal injury attorney can help you recoup damages. Almost one-third of vehicle collisions in this country are rear end crashes, accounting for 17,000 fatalities and 500,000 injuries annually. What do studies tell us about drivers and these accidents? Alcohol is not commonly cited as a factor in these incidents. 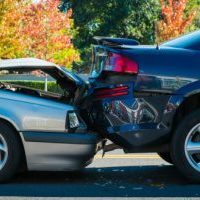 Because rear-end collisions involve the front bumper of the rear car colliding with the rear bumper of the forward car, the fault generally lies with the driver in the rear. An exception is when the car in front somehow creates an unavoidable hazard. In many cases, symptoms of injuries may not appear for days after a collision. The most common injury associated with rear-end crashes is cervical acceleration-deceleration (CAD) syndrome, more commonly known as whiplash. When the energy from the collision is transferred to the stationary car in front, it can bring disastrous results to individuals in the forward car. The heads and necks of individuals are suddenly and forcefully whipped back and forth, causing severe stress to the cervical spine. This can result in mild pins and needles tingling, or in excruciating pain. Range of motion may be impacted in the head and shoulders, and victims may suffer agonizing headaches and back pain. Additional health problems may involve abdominal swelling or pain due to internal bleeding. If a seatbelt was not securely fastened, lacerations, head trauma, and other significant injuries may be present. If you or a loved one experienced a rear-end collision resulting in serious injuries or death, you need effective, experienced legal counsel in order to obtain the financial assistance you deserve to deal with medical bills, lost wages, and property damage. At the Law Offices of Robert W. Elton, our team takes pride in our unwavering commitment to our clients. Contact us today in Daytona & Ormond Beach for your free, confidential consultation.